‘Prolific’ pawpaw, Aug. 15, 2014. When it comes to growing fruit at home, nothing could be easier or prettier than the pawpaw (Asimina triloba). This deciduous, multi-stemmed shrub or small tree can reach a height of 15 to 20 feet. Its 6 to 12 inch long, tropical-looking leaves turn yellow in the fall. Purple, one- to two-inch wide flowers appear in the spring and are pollinated by flies and beetles, undoubtedly attracted to the irresistible carrion-like scent of the blooms. 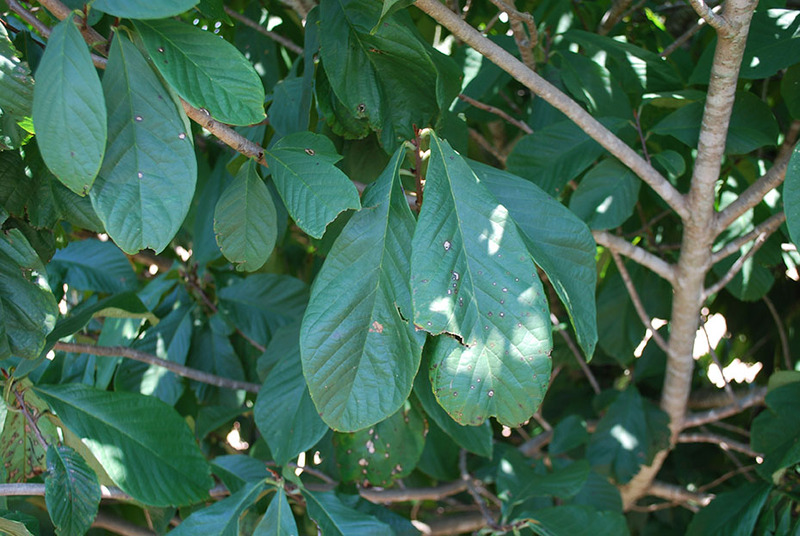 Cross-pollination must occur for fruit set to occur, because an individual pawpaw is incapable of fertilizing its own flowers. They give rise to large bean-shaped fruit, which grow to about three to six inches long and one to three inches wide. The fruit has a fragrant aroma, a custard-like texture, and a banana-like almost tropical taste. Over my lifetime I’ve eaten several pawpaws and encouraged many friends and acquaintances to try them as well. In short, you either like the flavor and texture or you don’t. Recently I discovered pawpaw’s laxative qualities, which led me to call it another common name: poopoo. 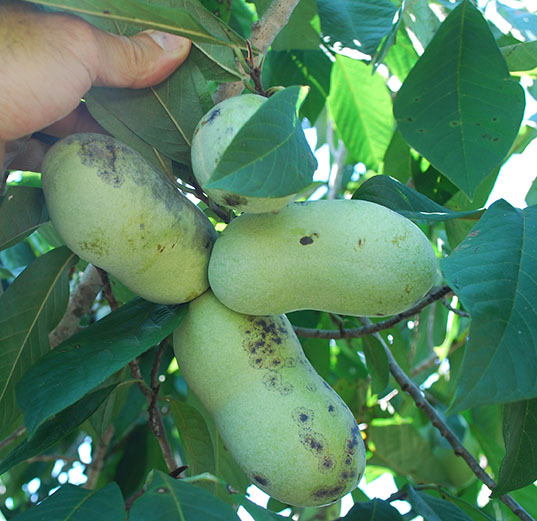 If you’re willing to experiment with pawpaw, choose named cultivars such as Shenandoah, Susquehanna, and Rappahannock. If price is more important than quality, purchase seedling trees. For additional information and links concerning pawpaws, visit the KSU Pawpaw Program. 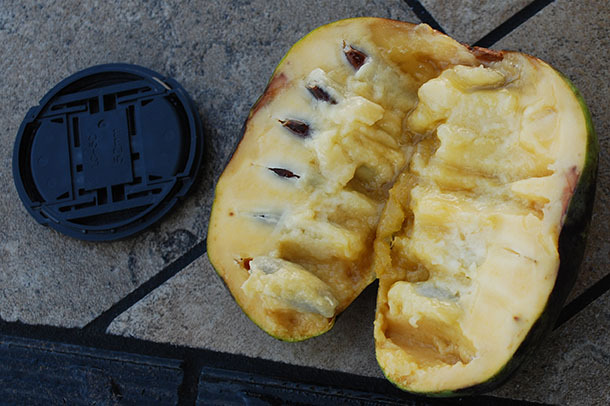 Also, listen to this NPR broadcast that aired on Sept. 5: A Coming-Out Party For The Humble Pawpaw, Native Fruit Darling by Allison Aubrey and Dan Charles.